VoIP’s extreme sensitivity to delay and packet loss compared to other network applications such as web and e-mail services, presents a real challenge. A basic understanding of VoIP traffic and of the quality metrics provided by VoIP monitoring tools will help keep your network running smoothly. 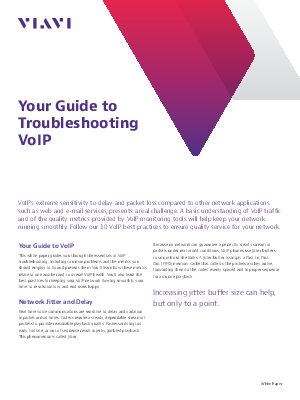 Follow our 10 VoIP best practices to ensure quality service for your network. troubleshooting, including common problems and the metrics you should employ to fix and prevent them. You’ll learn how these metrics relate to one another and to overall VoIP health. You’ll also learn the best practices for keeping your VoIP network flowing smoothly, your time-to-resolution low, and end users happy.